Where is the latte cup? This may not be the top-of-mind question for Fitzroy and Williamstown CYMS players as they head into a game that will decide the Premier C outright leader on Saturday, but apparently the last time the clubs met over a decade ago, it was for the best-looking coffee cup you’ve ever seen (or so rumour has it). And if anyone does have it, it’s time to give it back! Given the Cup cannot be found, it will need to be the victory that is the reward in itself. The lead in form of both sides is impeccable, with Williamstown surely taking favouritism as their superior percentage means they’ve held top spot all year. 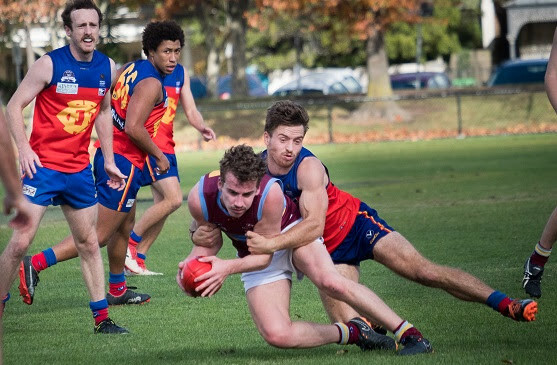 Last weekend’s Fitzroy home game against Marcellin was a strong contest and the final score was not really reflective of a game where the difference was just eight points at three quarter time. After a six goal to one final quarter, Fitzroy won 14.17.101 to 9.5.59. Aidan Lambert and Nino Lazzaro were in the goals with three each and Jack Dalton continued to provide a target with two. Nathan Jumeau (pictured) was best on ground and Rory Angiolella went on with his strong, consistent season. 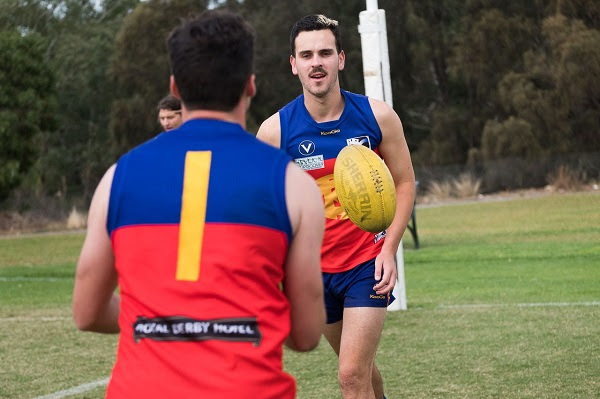 Luke Mahoney made quite an impression on the ‘For the Love of the Game’ team for the VAFA Podcast on Wednesday, with a lengthy interview about everything Fitzroy but particularly this weekend’s big game. Luke said he and the team were looking forward to the challenge of taking on Williamstown CYMS at Brunswick Street. 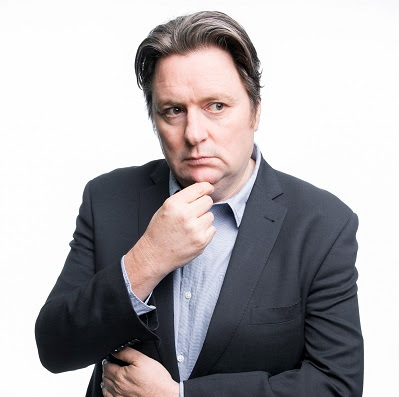 The Podcast is well worth a listen and can be found here. Fitzroy is a game clear at the top of the Reserves ladder now; a game ahead of Old Geelong and a game and a half up on this weekend’s opponent. It was another clinical second half display against Marcellin, after again trailing at half time. Fitzroy maintained the 6-0 form, winning 10.11.71 to 6.7.43. Jimmy Butler, Eddie Harley and Sam Batterton were in the best, while Gus Richardson and Josh Robson kicked two goals apiece. Head on down to Brunswick Street again tomorrow for a big game and there is sure to be a run on the burgers with no official club lunch this week. But keep reading for details of the guest speakers coming up. 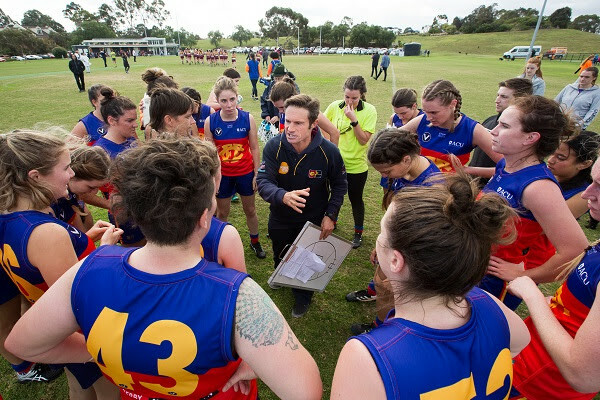 Fitzroy-ACU Senior Women’s team has drawn with top side and reigning premier Marcellin, to move into the top four of the Women’s Premier competition. 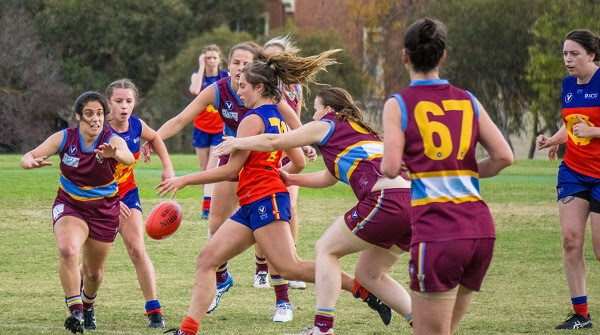 This was the first game Marcellin hadn’t won for the season and, but for a cruel last-minute bounce of the ball, Fitzroy may have taken the four points… it was oh so close for Ruby McDermott! Fitzroy-ACU had an early lead in the game before the top side charged home. Some excellent last line defence from Fitzroy enabled the home side to hang on and share the points, 5.4.34 to 4.10.34. This puts the Roy Girls right back in the contest for the final four. For all the analysis, here is the post-match interview with Mick Symons and Erin Gogerly, one of the team’s best, who kicked her first goal and had 24 possessions. Liz Olney kicked two goals, with Sam Hood and Hillary Collett kicking one each. Here are some terrific photos from the previous week’s win over Old Trinity, thanks to Peter Casamento. They might not have scored the points, but sometimes wins come in different forms. 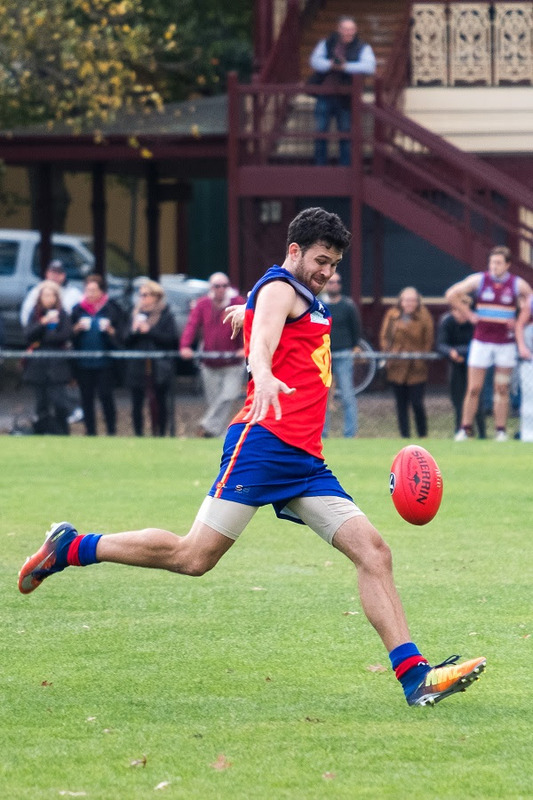 Averaging over 100 point winning margins this season, Marcellin shaped as a formidable opponent for Fitzroy-ACU Women’s Reserves side last Saturday. At half time, the Roy Girls had done a great job and trailed by just five points, with Tash Kroussov kicking the Fitzroy goal. Marcellin took things to the next level in the second half, running out winners 5.16.46 to 1.0.6. Nikita Smith and Phoebe Turnbull were Fitzroy’s best on the day. 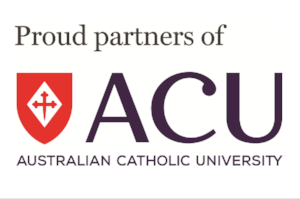 This weekend will be another great challenge for both Fitzroy-ACU teams against SKOB Saints. Susan developed a passion for medical research when her only child, Danielle, was diagnosed with Type 1 diabetes in the 1980s. Danielle tragically died from the complications arising from the chronic disease. 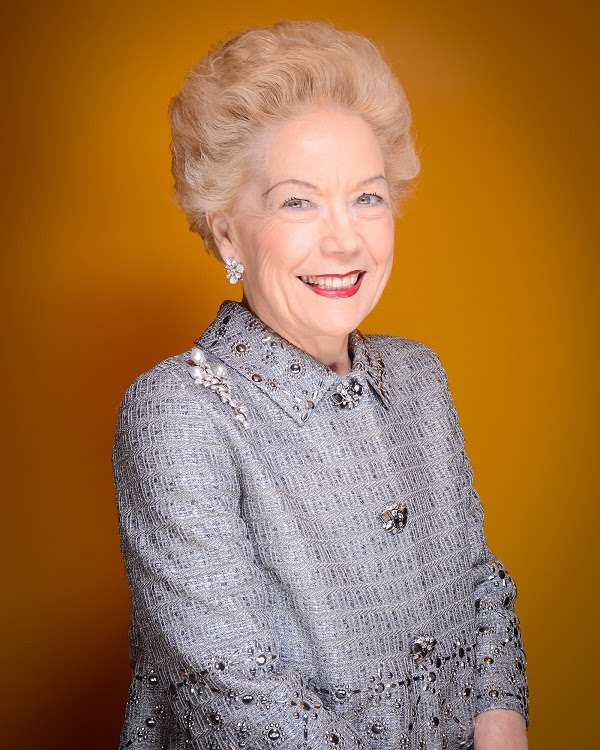 It was at that point Susan’s lifelong commitment to raise funds for better prevention, treatment and to find a cure for Type 1 diabetes became a dedicated mission. Many of us know the highlights of Susan't fascinating story, but you won't beat hearing it in her own words. 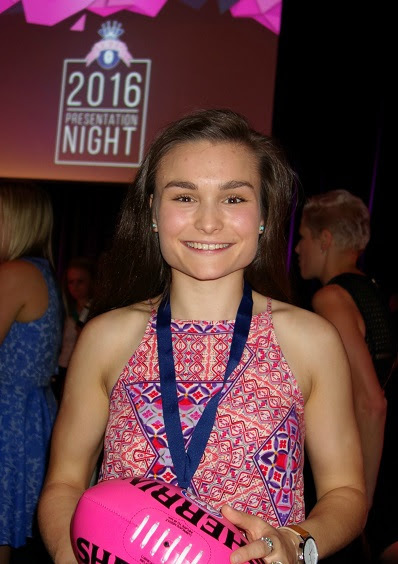 Remember when Ash Riddell won the Elaine Findlay Perpetual Trophy in 2016 as Fitzroy-ACU’s best and fairest in the same week she won the Debbie Lee Medal for best first year player in the VWFL? It was her first year of footy in 10 years; she kicked 36 goals and played in a grand final. She thought that was pretty good. But the new captain of the Melbourne University Women's Football Club (MUGGARS) has just been selected by North Melbourne to be part of their inaugural AFLW side when they join the competition next year. Congratulations Ash. This is fantastic news. 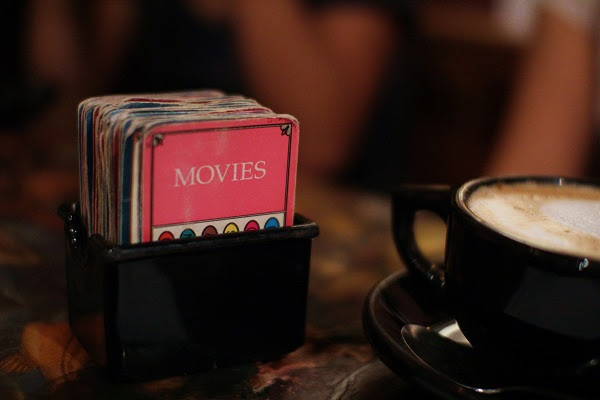 The Fitzroy Trivia night is just one week away and the top prize has been revealed. While there will be plenty of laughs on the night, people will be taking things a little bit seriously after Trivia Night host – our own Keith Dimech – announced the top prize for the night would be $500 cash. This will be a traditional community club ‘bring your own plate’ type affair, with the drinks at our usual bar prices . Get your teams ready for Saturday 26 May at the community rooms at Brunswick Street Oval at 7pm. Make sure you book online asap. Tickets are $25 a head. You can book your own individual ticket (just name your team on the online form), as a small group to be matched up with others on the night, or book a full table of 10. We have only 100 seats and some excellent prizes, so don’t miss out. Bookings close Thursday 24 May. More details coming soon. Keep an eye on the website for bookings next week. It was a Saturday night special over at Albert Park when the Fitzroy Thirds defeated Ajax; a bogey team for Fitzroy. If the singing of the song was any indication, the boys certainly enjoyed the win. It was a close game in cold, wet conditions, with Fitzroy taking the points 6.9.45 to 5.7.37. Isaac Wattis (pictured right) was best on ground and it was a night for the smaller, nimble guys, with Kai Menzies and Ben Witkowski kicking two goals each. Owain Dunn and Gizzy Mills also played strong games. The Thirds' form has been building over recent weeks; just missing out on the points despite very competitive performances. This victory sees them up to fifth on the ladder, but with a game and a lot of percentage to make up to repeat last year’s finals appearance. We think the winning form might have something to do with the hair – there’s a lot of good hair in the Thirds team. Check out the photo gallery from their last game at Ramsden Street. He came for lunch and he didn’t let his legion of fans down. Fitzroy star of the mid-80s, Mick Conlan, drew fans from far and wide when he visited Brunswick Street Oval on Saturday and he wasn’t hard to spot with his ‘tank’ credentials still intact, looking like he could still pull on the boots at age 60. From a former girlfriend to grown men who were nervous to ask for a photo, he didn’t let anyone down. 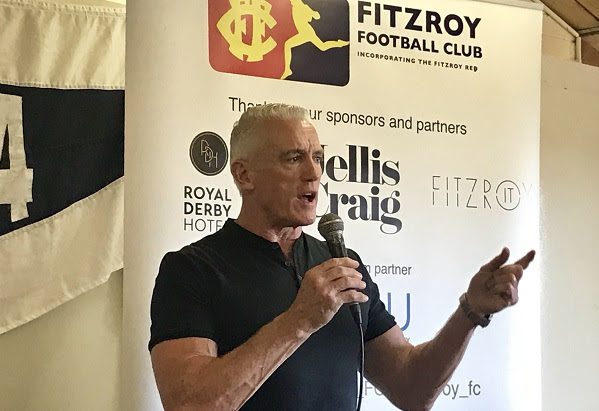 He was chatty and genuine and spoke of the joy he has in the fact that the former Fitzroy players can come down and see their old club growing and thriving in the VAFA. He was particularly happy to see the growth of women’s football and the way the club was embracing diversity from a female President on down. When he finished posing for photos with fans and signing autographs, he took off to fly to Canberra and see his mum for Mothers’ Day. What a guy! We hope to see him back soon.